John is an example of the triumph of spirit over difficulty, and an indication that God can use any type of instrument He chooses, if He has a certain work to be done. 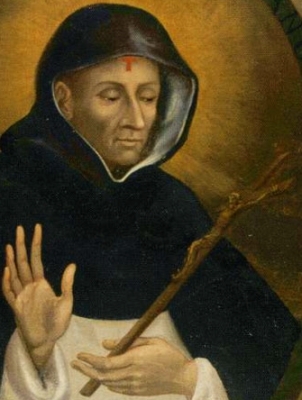 John was almost rejected by the Dominicans because he had such a severe speech defect that the superior felt he would never be able to preach–a real impediment in the Order of Preachers. The saint was born into a poor Florentine family. His early years were noted for piety. In fact, if anyone came looking for him, his mother would say, “Go and look in the church. He spends most of his time there.” He had a special love for the Dominican church of Santa Maria Novella, and he haunted it from early morning to late at night. It was not a surprise to anyone when, at the age of 17, he decided to enter the Dominican order. Here several difficulties presented themselves. John had no background of education, which was absolutely necessary in an order of scholars. To make matters worse, he had the speech defect. Some of the fathers felt that he should support his parents, although they protested that this should not stand in the way of their son’s vocation. It was two years before John was allowed to begin his novitiate at Santa Maria Novella. The order soon discovered the treasure they had. John excelled in theology and Sacred Scripture, and so he was sent, with the other superior students, to finish his studies in Paris. Now he was face to face with the difficulty that his superiors had seen from the beginning. An ordained priest, member of a preaching order, he must fulfill his vocation by preaching. His superiors attempted to forestall any embarrassment by assigning him work in the house. John felt that the intervention of heaven was required, so with the utmost simplicity he prayed to Saint Catherine of Siena, who had just died, to cure him. The impediment disappeared, and John joyfully began to preach. He became one of the most famous Dominican preachers. In 1392, after years of successful missionary work in all the cities of Italy, John was appointed vicar-provincial of the Roman province. It was a task that, both intellectually and spiritually, called for a giant. The plague had cut into the order with such devastating effect that regular life barely existed. The convent of Santa Maria Novella had lost 77 friars within a few months; other convents were in even worse condition. The mortality had been higher among the friars than anywhere else, because they had gone quite unselfishly to the aid of the stricken people. However, this misfortune had left the order perilously understaffed, and there were a good many members who believed quite sincerely that the conditions of the time called for a mitigated observance of the rule. Many of the houses were already operating in this fashion. It was to be the principal work of Blessed John Dominici to right this condition, and bring back the order to its first fervor. Difficult days were in preparation for John Dominici. He was appointed cardinal in 1407, named archbishop of Ragusa, and chosen as confessor to the pope. Due to schism, there were two claimants to the papacy. The situation grew even worse when, after another election, no less than three powerful men claimed to have been lawfully elected pope. Largely through the diplomacy and wise counsel of John Cardinal Dominici, the rival claimants to the papal throne agreed to withdraw their claims, and the groundwork was laid for the election of a new and acceptable candidate. At this time, John Dominici publicly renounced his cardinalate, thus indicating to the enemies who accused him of political ambition that he cared nothing for honors in this world. John was preaching in Hungary against the heresies of John Hus at the behest of the pope when he died. He was buried in the Church of Saint Paul the Hermit in Buda. Many miracles were worked at his tomb before it was destroyed by the Turks (Benedictines, Dorcy).